Is it a retrospective screening or a house party? It's two terrifying events in one! In these days of streaming video, when classic and cult films of yore are available at the click of a button, revival screenings are becoming a thing of the past. How is it possible to lure audiences into theatres to see films they could easily view in the comfort of their own homes? Hoodihoo Productions is exploring a possible answer to this question: screenings presented with a party atmosphere, giving fans an opportunity to socialize with like-minded enthusiasts. 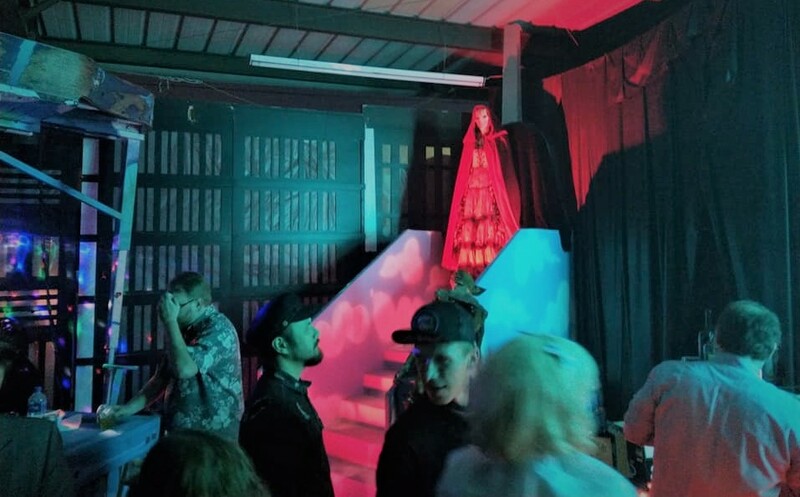 The group's mission statement is "to provide pop-up screening events for our guests to have a ball ... creating genuine, authentic community and experience around film, music and fun." Their November 30 event at the Saban Theatre in Beverly Hills, dubbed "Throwback Thursday," combined a Zombie House Party with a 15th anniversary screening of 28 Days Later (2002). The result was a little bit like attending the opening night party of a film festival, with guests in attendance, live music, photo ops, and a bar - in other words a splendid time, even if one had seen the film before. The Saban - more of a film palace than a mere theatre - is certainly an excellent venue for such an event. 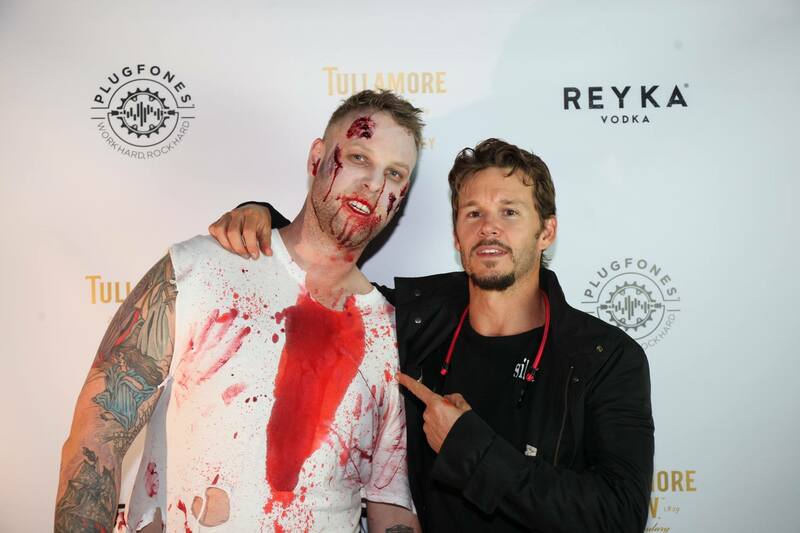 Hosts Ryan Kwanten (Jason Stackhouse in True Blood) and Chuck Walton (former Fandango editor-in-chief) were in the lobby greeting guests and making sure everyone had a good time, lending the event the aura of a gathering of friends. A bloody zombie lurked on the red carpet, luring "victims" in front of the camera to have their pictures taken. Further along, makeup artists transformed guests into the living dead for a separate photo booth, complete with props (bloody knives, etc). A couple of tables offered zombie-themed merchandise, such as fan art and posters. There was a private bar for VIP guests, though the entrance was not well policed; in any case, the bar in the main lobby mixed a mean martini that was as effective as the makeup artists at turning humans into mindless walkers. Later, the instrumental soundscapes of The Sandmen were pumped into the lobby. 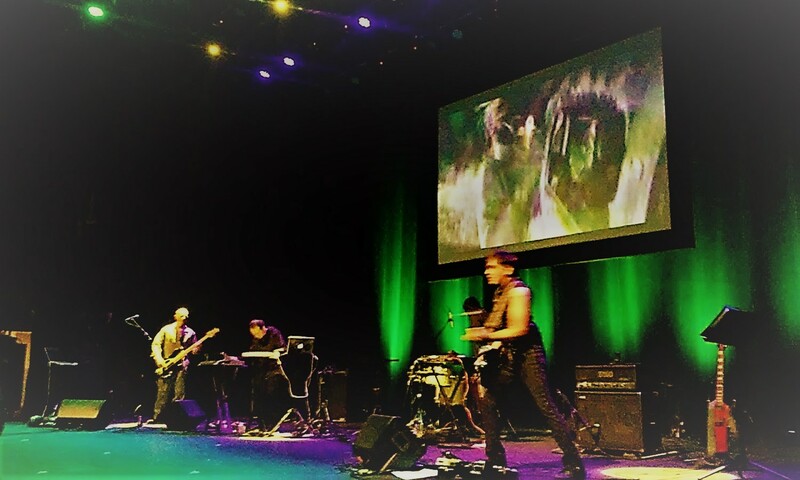 The quartet's moody but energetic performance was the highlight of Throwback Thursday's Zombie House Party: though the music had the hypnotic, droning quality of a Tangerine Dream soundtrack, it was enlivened by actual electric bass and lead guitar layered into the synth-and-rhythm patterns. The only problem was that no announcement was made when their set started, so several guests in the lobby thought they were still hearing recorded music and missed half the show - which sounded infinitely better in the theatre than in the lobby. As 8:00pm rolled round, The Sandmen wrapped up and surrendered the stage to Kwanten and Walton, who interviewed composer John Murphy about his score for 28 Days Later (reviewed here). After the screening, as guests filtered back out onto Wilshire Boulevard, I asked Kwanten about future Throwback Thursday screenings. 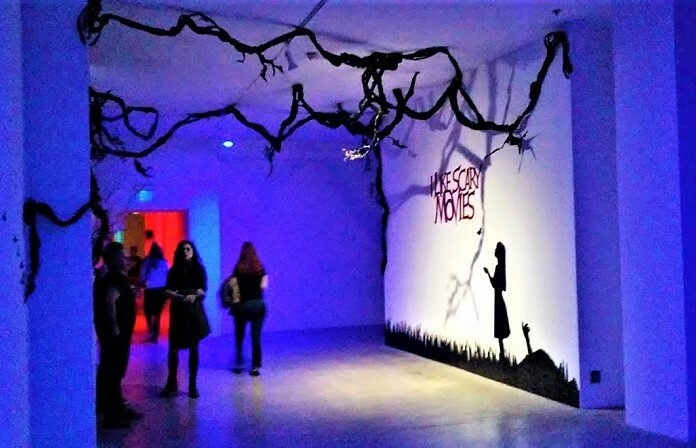 Though none are currently scheduled on the official website (hoodihoo.com), there are plans for a smaller-scale event at a winery in Malibu; possible titles include The Witch (2015) and an unspecified Kubrick film (presumably The Shining, though A Clockwork Orange seems to be perennially popular on the revival circuit). For those who enjoy seeing movies in a theatrical setting with a receptive audience, we hope Throwback Thursday becomes a regular event. A bit like attending the opening night party of a film festival, with guests, live music, photo ops, and a bar – in other words a splendid time, even if one had seen the film before. ← Shape of Water free sneak preview tickets available.